When you are working in just about any facility and you look up, you are likely to see dozens of different pipes that seem to be running in every direction. These pipes are carrying all sorts of different things to areas throughout the facility where they are needed. In most situations, transporting things through a facility by piping systems is an excellent way to safely get things where they need to go. If the pipes are not properly labeled, however, it can be a recipe for disaster. This is why the ANSI A13.1 standard was developed and put in place. 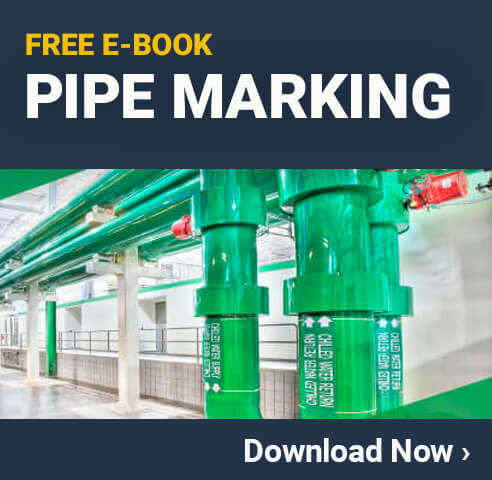 This standard, which is followed in facilities throughout the country, addresses what types of pipe markings are necessary in which situations. These standards are not strictly required in most industries, but a growing number of industries have adopted it because of the excellent benefits it provides. Given the fact that there are many different pipes that go through most facilities, it is essential to know which ones are transporting what type of thing. For example, one pipe may be supplying water to a machine for cooling, or to the fire suppression system. Another pipe may be transporting natural gas that is used in fuel for a furnace. Machine Malfunctions – If a machine requires a specific fluid, and it is attached to the wrong pipe by mistake, it can cause extensive malfunctions and even permanently damage the machinery. Maintenance Problems – When the maintenance team is replacing an area of piping, they may not take the proper precautions if they don’t know what is in the pipe. If they cut into a pipe thinking it only had water in it, but it was actually filled with a flammable gas, for example, the results could be deadly. Opening the Wrong Valves – Someone may be looking to open a pressure relief valve to reduce the steam pressure in a machine. If it is nearby another valve that contains a toxic chemical, however, they may open the wrong one and expose everyone to the danger. Slowing Emergency Response Times – Some pipes contain things that may be needed in an emergency. When an emergency responder sees multiple hook up areas, they will have to figure out which one is for the fire suppression system themselves if it is not labeled properly. Of course, there are many other examples of problems that could occur when the pipes are not clearly marked with what they contain. The ANSI A13.1 standard also covers the valves and connectors that are used in piping systems, so following this set of standards will help ensure everyone is easily aware of what is within any given pipe. The ANSI A13.1 standard lists a number of very specific color combinations that are to be used for certain pipes. Using these colors will help ensure everyone can see what is in a pipe, even if they can’t clearly read the text that is on the piping itself. If you have pipes that carry something that doesn’t fit into any of these categories, you can create your own color codes. When doing this, it is important to document exactly what the color standard is, and how it is being used. This information should be provided to everyone in the facility, and it should be clear on the labels themselves. Of course, you’ll also want to make sure the standard is followed throughout the facility to help avoid any confusion. If you are looking to bring your facility up to the ANSI A13.1 pipe marking standards, you’ll need to have easy access to the right type of labels. You can do this by ordering the specific labels you need from a third party printing source. They will create the labels for you, and deliver them right to your facility. Many companies, however, choose to purchase their own industrial label printer so they can print the labels they need right on site. While it will cost a little bit more up front, it will more than pay for itself over time. It may even pay for itself just from the savings on the initial labels that will be used to mark the pipes in your facility. One of the best options when it comes to purchasing an industrial label printer is a LabelTac printer. They come in a number of different models, so you can choose one that meets your specific needs. Whether you just need a small label printer, or you want to use it to make large safety signs too, LabelTac has something for every facility. The best thing about using a LabelTac printer is that all your labels will be made with extremely high quality materials. The labels that you print onto, for example, are durable and long lasting. The labels that are printed are waterproof and can stand up to just about any situation in your facility. Due to the great quality of the labels, you can print them off and be confident that they will last for years to come. This is important for pipe labeling projects since it is often difficult and inconvenient to get up into the area where the pipes are run. When you know you’ll only have to do it once, it makes the project much more achievable. Of course, these labels can be used for far more than just pipe markings. They can be used to meet a wide range of OSHA labeling and hazard communication standards throughout the facility. This is why a growing number of facilities throughout the country are moving toward this type of printer for all their labeling needs. One of the most important parts of planning any pipe labeling system is determining where the labels will need to go on the pipes. Each facility will have to come up with the specifics on their own, but the following are some great general ideas that can be helpful in any situation. Distance Apart – When labeling long runs of pipe, determine how frequently a label should be put in place. 50’ is often considered the maximum distance, but you may want them much closer depending on the lighting and other factors in your facility. Split in the Pipe – If the pipe splits off into two or more directions, each of the new pipes should be labeled to ensure it is clear that they all contain the same thing. Valves – Before and after any major valve, there should be a label. This will help to avoid any confusion. Combining of Pipes – If a piping system is used to mix two or more fluids, it is important to make that clear. Having the pipes labeled as they combine into one pipe, and then the new larger pipe should be labeled too. Faucet or Connectors – The area where the pipe comes out of a wall or where people can hook up hoses or other devices to it should be clearly labeled too. This is often in the form of a faucet or some other item where the gas or fluid in the pipe is actually used. Of course, you’ll also want to use common sense when placing pipe markings. You don’t want to over label things, as that can get confusing and crowded. On the other hand, since the labels are so affordable and easy to use, you also don’t want to skip using a label where it could provide any type of safety benefit to the facility. Once you’ve put labels on all your pipes, you’ll need to make sure that they are kept clean and easy to see from throughout the facility. For any pipes that are near the ground, this is not a problem. You can have your normal cleaning or maintenance department take care of keeping them clean. Scheduling – You can set it up so the pipe labels are wiped down at the same time that your lighting system has the bulbs changed. Most facilities need to have their lighting changed at least once per year, so someone will be up in the rafters anyway. Taking a little extra time to wipe down the labels just makes sense. Extension Cleaners – It is possible to put a high quality dust rag at the end of long polls that can reach up into the rafters for many facilities. This will allow the pipes to be cleaned when necessary, without the hazard of getting up into the high areas of the facility. Contract Cleaning –There are often cleaning companies that specialize in cleaning areas that are high up off the ground. It may be a good idea to hire them to come in a few times per year to wipe down all the pipe surfaces, including the labels. In addition to keeping the labels visible, it will help you to maintain a cleaner overall facility. Once nice thing about labels that are high up in the rafters is that they won’t get dirty nearly as fast. This makes it possible to only have to have them cleaned on rare occasions. When this is the case, however, you need to make sure someone is checking the status of the labels to ensure they haven’t become difficult to read in between cleanings. If you have decided that the ANSI A13.1 pipe marking standards are something you want implemented into your facility, you will want to make sure you take the time necessary to ensure it is done right. This starts with ordering a high quality LabelTac printer, and the necessary label stock to create all the labels that are needed. While waiting for the printer to arrive, make a plan on which pipes will be labeled with what types of markings. Ideally you should have a set of blueprints that show where each label is coming from and going to, and what it is transporting. You can take that information and determine exactly where you want the labels to be placed in order to ensure every pipe has the necessary labels to be ANSI compliant. Keep in mind that in addition to just the main stretches of pipe, you’ll also want to label the valve areas and any other parts of the piping system that will help improve the overall safety of the people who work with or around these pipes. In addition to just planning out where you want your new labels to go, you should make a set of standards for when additional piping is added to the facility. Taking the time to ensure all new pipes are properly labeled before they are even put in place will help avoid problems down the line. This will also help ensure your facility keeps up with all the recommendations made in the ANSI standards. Coming up with the implementation plan, and the plan on how to deal with new piping, will take quite some time and effort to complete properly, but if you do it right now, you won’t have to worry about it again for many years.